A file with the .CAB file extension is a Windows Cabinet file (they used to be called Diamond files). They're compressed files that store data related to various Windows installations that might involve device drivers or system files. The Microsoft Publisher program's Pack and Go feature can make CAB files that end with the PUZ file extension. Within it is everything included with the document, in the same archive format as CAB, so they can be treated just like CAB files. The InstallShield installer program makes files with the CAB extension, too, but they're unrelated to the Windows Cabinet file format. Some devices might use the CAB file extension to store firmware files. 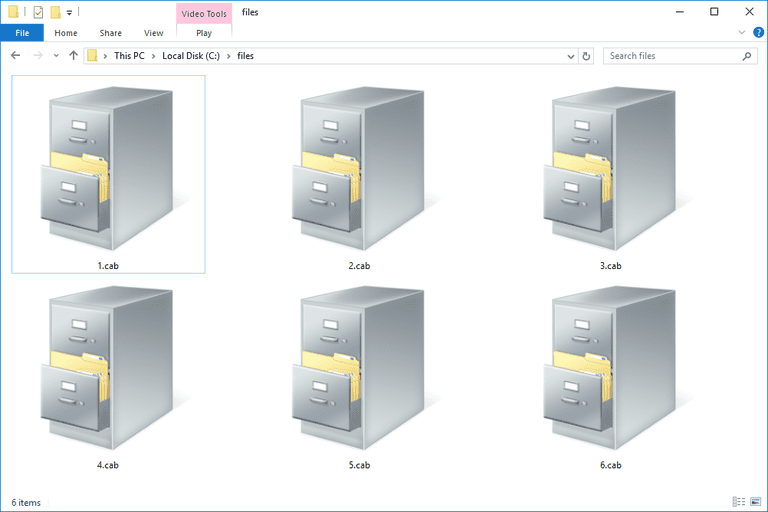 Opening a Windows Cabinet file in Windows will automatically launch the file as an archive so you can see what's inside. Windows essentially treats it as a folder, and does so automatically; you don't need to download a CAB opener for Windows. However, you can also open or extract CAB files with a file decompression tool. Going this route lets you open CAB files on other operating systems like macOS or Linux. A few free file extractors that work with CAB files include 7-Zip, PeaZip, WinZip, IZArc, The Unarchiver, and cabextract. If you have a PUZ file that came from Microsoft Publisher, you can open it with any of the file extractors just mentioned. If those programs aren't recognizing the PUZ file extension, either open the file unzip software first and then browse for the PUZ file or change the .PUZ file extension to .CAB and try again. InstallShield CAB files aren't the same as Windows Cabinet files but they can be extracted with unshield. Don't press Enter until you've written the whole command. Regardless of any breaks in the command that you see above, only include spaces until you reach the very end. Open the Run dialog box with the Win+R keyboard shortcut. Enter lpksetup (the first letter is a lowercase L). Choose Browse to locate and select the CAB file. Wait for the whole process to finish. It might take a while. You can close out of the Installing display languages screen when the Progress says "Completed." To switch to the new language in Windows 10, open Settings and then navigate to Time & language, then choose the Region and language tab on the left. In older versions of Windows, it's Control Panel > Clock, Language, and Region > Language. Finally, select the language you want to use and follow the directions shown, if any. There aren't any file converter programs we're aware of that can do a clean CAB to MSI conversion. However, you might find help from other InstallShield users in the Flexera Community. WSP files are SharePoint Solution Package files used by Microsoft SharePoint and compressed in the CAB format. You can rename the WSP file to CAB and open it like you'd a Windows Cabinet file. You can convert CAB to EXE with IExpress Wizard, a tool included in Windows. Open the Run dialog box with the Win+R keyboard shortcut and then type iexpress. If you need to convert CAB to KDZ to get an Android firmware file in the right format, follow the instructions at BOYCRACKED. Windows might compress a CAB file with DEFLATE (like most ZIP files), Quantum, or LZX since the format supports all three compression algorithms. Every CAB archive is compressed as a whole instead of each file individually. A CAB archive can hold up to 65,535 CAB-folders, and those folders can contain an equal number of files. When a CAB file is actually used by an installer, the files contained within it are extracted on an as-needed basis and in the order that they're stored in the CAB file. A large file can be made into multiple CAB files so long as no more than 15 files span to the next CAB file. This means that you could have up to 15 files in one CAB file that span to the next CAB file in the series, and that one could even have up to 15. CAB files are recognized by the first four bytes. If you open a CAB file as a text file with a text editor, you'll see "MSCF" as the very first four letters. You can read more on the Windows Cabinet file format from Microsoft's Windows Dev Center and Microsoft Cabinet Format pages. Can You Delete CAB Files? It might be tempting to delete CAB files from your computer when you see dozens or even hundreds of them in one folder. What's extremely important before deciding this is to understand where the CAB files are and whether or not they're important. For example, CAB files in the system32 folder should be kept no matter what. Trying to decipher what's important in here can be really confusing, and making a wrong decision could cause problems later on since Windows might need the CAB file you deleted to fix a corrupted file. However, CAB files that are related to iTunes, DirectX, or some other third-party program can probably be safely deleted without causing system damage, but they might make the program stop working or prevent certain tasks from running. If the program stops working after deleting the CAB files, just repair it or reinstall it, but chances are that these kinds of CAB files are only temporary. Due to the nature of what CAB files are, it's common to see them within the setup files of a program. For example, the Microsoft Office installer includes several CAB files, some of them pretty large. If these are removed, it would corrupt the installer and you wouldn't be able to use those setup files to install MS Office. Some software will dump cab_xxxx files into the C:\Windows\Temp\ folder while installing updates or doing some other system related task. It's completely safe to remove CAB files in this location unless your computer is actively updating or installing software (since they might be being used at that time). If you can't delete CAB files because they keeping regenerating (e.g., the C:\Windows\Logs\CBS\ folder keeps making LOG and CAB files), try deleting the oldest LOG file there (or all of them) and then remove every CAB file from C:\Windows\Temp\.